"Consciousness is your operating system. Mindfulness is the upgrade." Imagine for a moment that you were a computer. What sort of error messages would you have seen already today? You are attempting to relax. This function is not permitted. Anxiety detected. Processing may be haphazard. Internet distraction detected. Program: CREATIVITY quit unexpectedly. Emotions detected. Attempting to override. Depression detected. Run program: SMILE. Unable to shut down. SLEEP program unavailable. Human software SAMEOLD is corrupted. How many of these system errors ring true for you? Quite a few...? Don't worry. You are not alone. Let's take stock for a moment and acknowledge that working professionals are facing more demands on their consciousness than at any time in human history. Today, we have never been so connected to one another, so overwhelmed by information or so unprepared to successfully navigate this data-laden world. Whilst advances in the technologies of data-sharing and connectivity have been exponential, advances in our human ability to process information have not. Consequently, as Frances Booth explains in The Distraction Trap, we are measurably losing crucial human capacities, including reading, solitude, memory, sleep, journeying, creativity, listening, learning and relationship. Although it seems like forever, Google has only been a word since 1997. The demands of professional life have changed unrecognisably in less than two decades, yet most of us are still trying to cope with the SAMEOLD software. That's to say, we were never taught how to remain stable, calm and well in the "Age of Information." Instead, we have become 'Generation Distraction'. It is hardly surprising that anxiety, stress, burnout, addiction and depression flourish in our homes and workplaces under these conditions. Yet these increasingly prevalent modern ills are hardly natural states for the human being. We might reflect that we actually feel most natural when we are relaxed, when we are welcome to be our true selves, when we have time to connect meaningfully with others and when we are fully present with our experience. Now think of your own work-day and assess whether those natural ways of being are supported by your work practices or encouraged by your leadership and culture? 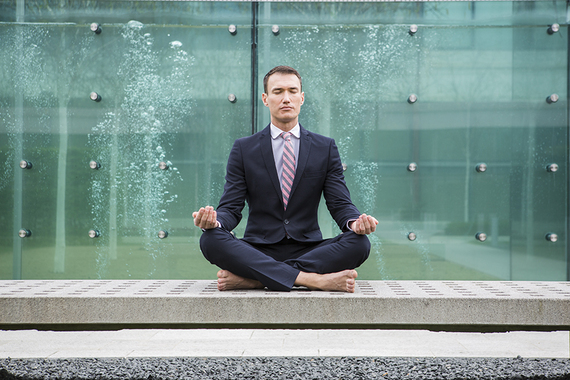 Fortunately, companies are now beginning to take wellbeing seriously and corporate mindfulness training programs are being brought in to offer this long overdue upgrade in professional consciousness. Mindfulness offers a gentler way of expressing excellence. It introduces you once again to the breath, to stillness, to authenticity and to focus. From there it may take you back into your creativity, your enthusiasm and even your purpose. How does Mindfulness do this? Well, it is a tool and a technique. It is also an approach to life. By increasing awareness and focus through simple practices it gradually teaches us how to be busy without being anxious, how to be assertive without being cold, how to listen and remain present, how to be the very best whilst championing (not sacrificing) personal wellbeing. More than those things, the rise of mindfulness heralds a revolution in consciousness. We have no way of knowing how our world will change as a result, but we have every reason to be optimistic. For mindfulness is founded on principles of presence, truth and compassion. Whilst we need not fear that mindfulness will make business soft, we may find corporations, and the professionals within them, becoming increasingly self-aware, emotionally intelligent and responsible for their impact within the corporate environment and the world at large. I for one am looking forward to a very bright, and conscious, future.